There are many opportunities to experience the World Heritage Area of Ilulissat Icefjord on your own or with one of the tour agencies in Ilulissat. During the summer many visitors choose to explore the Icefjord on foot. There are three designated hiking trails of varying duration – from an hour to day trips. 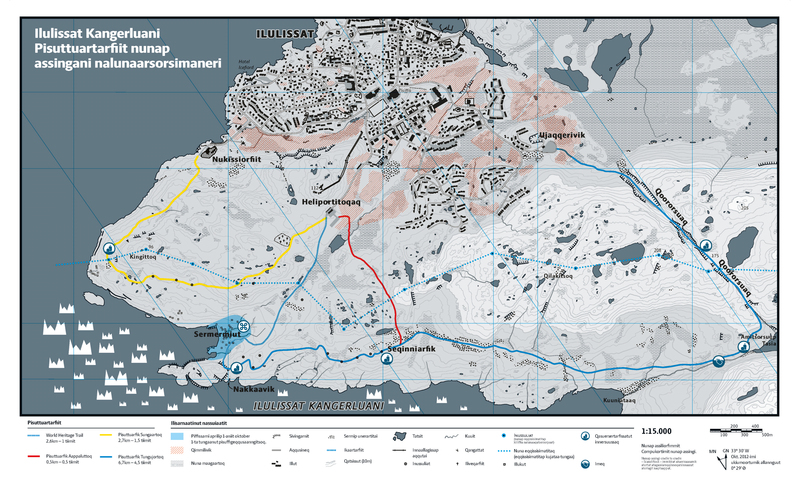 Hiking maps of the marked routes can be downloaded below or purchased in Ilulissat. Experienced hikers have the opportunity to explore the wilderness south and north of the Icefjord by joining tours lasting several days, bringing tents and maps. Trips of short as well as long duration are characterized by the fact that the terrain is relatively hilly and possibly moist. This means that you should take your time and bring sensible footwear. You can neither rely on satellite coverage nor on meeting other people en route. For this reason you should always inform other people of your hiking plans, and tell them when you expect to return. If you are not used to walking alone in the mountains, we recommend that you sign up for a guided tour. If you want to go on longer hikes, we advise you to bring the hiking maps of 1:25,000 and 1:100,000 published by Greenland Tourism (can be purchased in Ilulissat). Sailing and HelicSailing in the mouth of the Icefjord is a popular way of experiencing the large icebergs. Usually it is impossible to sail in the fjord because of the large amounts of ice. Should it be possible, the law allows only commercial fishermen and sealers to sail into the actual Icefjord. Cruise ships and other ships above 1000 GRT are not allowed into the World Heritage Area. Tourists are only allowed to sail in powerboats. There are good opportunities to go on dog sledge trips in the World Heritage Area – anything from a few hours to actual expeditions. The sledges will take you into the mountainous areas as well as onto the sea ice. The sledge season typically lasts from October to the end of April. During this phase a ski run open to everyone is established in the area around the Sermermiut Valley. Snowmobiles are not allowed in the World Heritage Area due to sound and air pollution, as well as the risk of wear and tear of the terrain and the vegetation. The Arctic nature and environment are particularly vulnerable. Please consider this fact, when you select your means of transportation, and when you walk around the World Heritage Area.